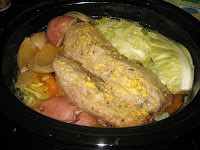 I celebrated St. Patrick's Day with my family last night with an Irish-American dinner of corned beef and cabbage. When I started researching recipes for corned beef and cabbage I learned it was more of an Irish-American dish than a traditional Irish dish. Since my mother-in-law was craving it I thought it would be better to make that versus an Irish stew (which IS traditional). The dinner was VERY good. We listened to Irish folk music and enjoyed classic pub songs as well as traditional songs. I had a couple of Guinness'. I had forgotten how much I enjoy Guinness. I bought my kids t-shirts to wear for the holiday as I think it is important for them to be proud of their heritage.